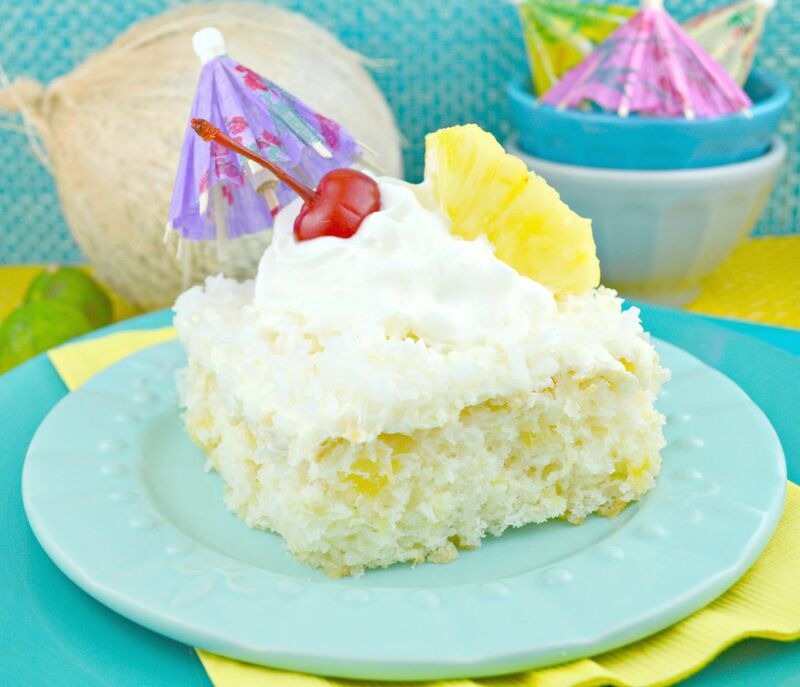 Pina Colada Sheet Cake! 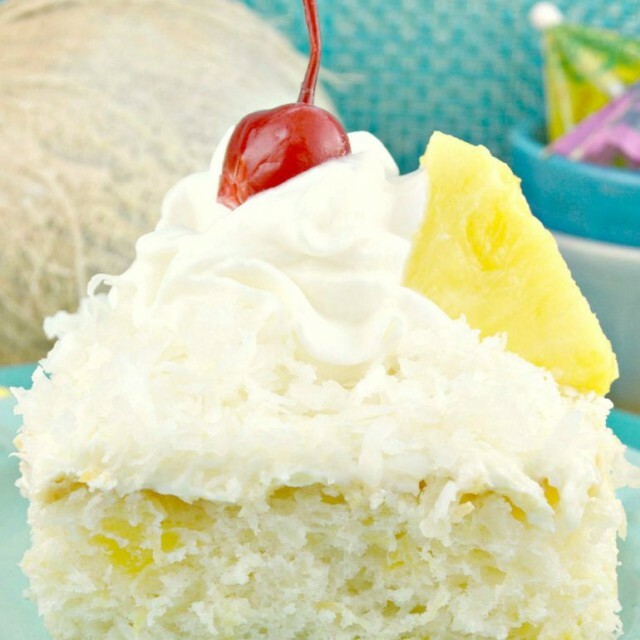 A cake flavored with pineapple, coconut and dark rum? Yes, pleeeeeeze!!!! This recipe was given to me by my darling friend Mary! It has been passed around and shared through neighbors and friend for at least a decade. It’s one of those recipes that is worth its weight in gold. It’s super, super easy-peasy to put together. Moist beyond belief, tender, filled with luscious fruit and coconut. Each fork full is literally like an amazing flavor explosion in your mouth! And it’s all done with a doctored up cake mix! The cake mix is like an ingredient in this recipe. Do not follow the instructions on the box or add the ingredient that the box calls for. Make sure you don’t drain the crushed pineapple. Just dump the whole can, fruit, and all the juice, in the bowl. You can make this cake with rum, rum extract or without any rum flavor at all. If for some reason you don’t care for the flavor of rum, or simply don’t have any on hand, believe me, this cake will still be crazy delicious without it! If you like the flavors of extracts you can use rum extract in the cake and a bit in the frosting. I find that some people object to the flavors of extracts. If you are in this camp, using rum is an easy choice. You can add 1-2 tablespoons to the cake batter, then brush a mixture if 1 tablespoon of rum mixed with 1 tablespoon water on the still warm cake, and put a 1 tablespoon in the frosting. It depends on how much you want to spike the flavor of the cake! My preference is to add 2 tablespoons of dark rum to the batter and then brush the top with 1 tablespoon of dark rum mixed with 1 tablespoon of water. For me, that’s just the right amount of rum. I bake this cake in a 9X13 inch Pyrex baking dish and it’s perfectly done in 30 minutes in my oven. 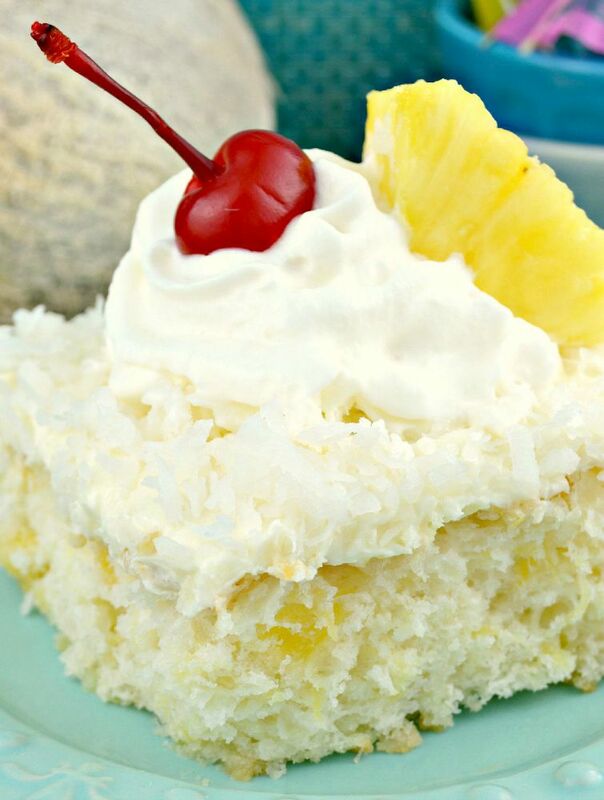 Pina Colada Sheet Cake~A delicious, incredibly moist, delicious cake flavored with pineapple, coconut and dark rum! Preheat the oven to 350 degrees. Spray a 9X13 inch baking dish with nonstick cooking spray. In a large bowl, mix cake mix, crushed pineapple and it's juice, 1/2 cup coconut, and 2-3 tablespoons dark rum until well combined. Pour batter into prepared baking dish and bake in preheated oven 28-35 minutes or until the top is golden brown. Mix 1 tablespoons dark rum in a small bowl with 1 tablespoon of water. When cake comes out of the over apply the rum and water mixture to the top of the cake with a pastry brush. 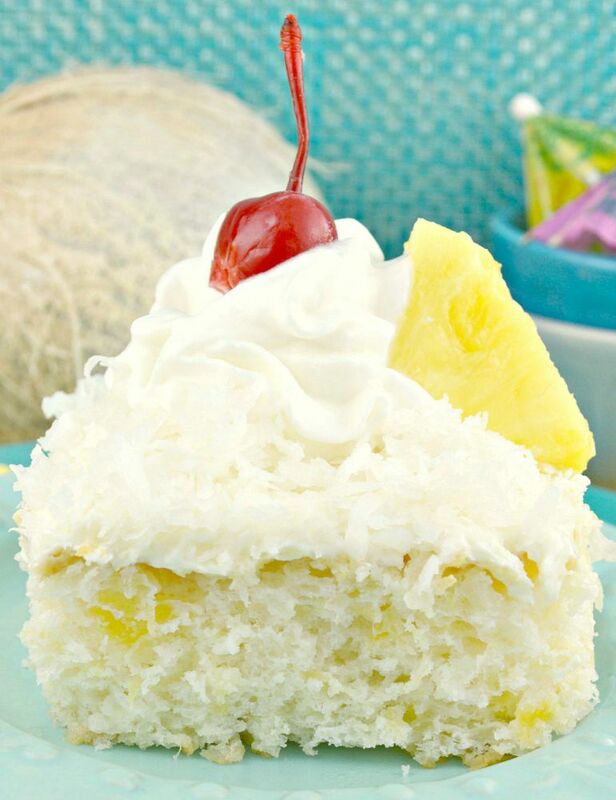 Allow cake to cool completely and frost with the prepared frosting then sprinkle the top evenly with 1/2 cup coconut. Garnish, if desired, with pieces of pineapple and maraschino cherries. Pig Pickin Cake– Our crowd-pleasing Pig Pickin Cake is an incredibly moist, delicious, refreshingly fruity delight. Super easy to make, it’s sure to become a new favorite! I’m not seeing the recipe. Your comments, recipe notes and photos are all there. something is wrong with your print friendly – it printed out 11 pages for this recipe – ouch!! Oh Grandma Wayne I’ so sorry! My tech people will hopefully get it fixed first thing Monday. There seems to be a glitch with WordPress and my site! Again, sorry!! !